Turtle Moon Studios. Susan Shie. Turtle Trax 1-3-00.Page One. This is the dawning of the Age of Aquarius! Happy New Year, Decade, Century, and Millennium, Everyone! Whew! This month's diary is in two parts, and there's a link to the second page, at the bottom of this one. Or you can go to Paage Two now. No glitches for Y2K! Congratulations, fellow Earthlings! Let's whoop it up! Only, we can't party like it's 1999 anymore, and Prince has retired that song! Above is one of the 49 separately hand drawn and painted little pieces I made as Christmas presents. No tracing, no printing. All fun, tho! First things first! My husband, important cummunity figure that he is, made it into the local newspaper, The Daily Record, on New Year's Eve, because they were doing a story on how people were going to spend their time, on that auspicious night! 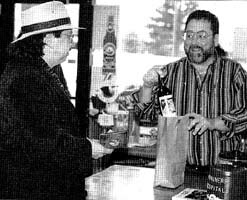 He was buying a bottle of our favorite wine, Bully Hill's "Love Goat," from Kenny Raynor of The Party Shop. You can see the snow coming down outside, and almost make out the wonderful label on the Love Goat, as it goes into its bag. Actually, since this photo, which had been taken a few days earlier, Jimmy went back and bought us some champagne for the celebration! We gave the Love Goat to Gretchen and Mike. If you've been following this diary, you know we left off in mid tale of our trip to Washington University in St. Louis in October, where we did our first work on an upcoming three year project, in which Island Press will make 16 full sixed prints, real quilts, of "The Cookbook/Hierophant: Card #5 in The Kitchen Tarot." Here is a picture of the first draft of the print, in its flat surface stage. All the panels have been printed with collagraphs. The next stage will be to pad and stitch together each panel. Then, as each whole quilt's worth of panels are ready, they'll be sent to us, and I'll write diary stories on all the panels. (So each print in the edition of 16 will have its own different diary.) 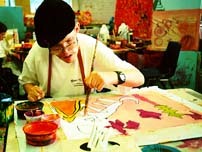 Then, back at Island Press, the printmakers will quilt and embellish each quilt/print with beads, etc. The piece is about six feet tall, I think. The only part missing from this proof is the metallic gold Lumiere paint I used to highlight each panel. Some of the colors have been hand painted in, after the fabric panel went through the press. Island Press is VERY experimental, and they allow hand painting, within the definition of printmaking. I thought I should throw in a shot of what the proof looked like, before I hand painted all the white areas of the panels. You can see that the fabric is satin, the heavy bridal type. We were thinking that more collagraphic blocks could be made for each panel, to create the other colors. And then we realized how nasty that could really become! I worked hard, all week, to convert these printmakers into painters, and here was yet one more chance. "Listen you guys: This will go a LOT faster if you just paint in the rest of the colors." And I reminded them that they pride themselves in being so radically experimental. They were pretty worn out by now, so they happily gave in! And I got me a chair, and grabbed the acrylics! I am really, REALLY happy when I get to paint. After watching them mix inks and rub them into plates,the one process they wouldn't let us help do, this felt wonderful to me!!!! And I stopped yawning! The afternoon was saved! Hurray for painting! And here is Jimmy, gleefully working at his favorite process, tooling leather. 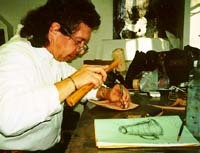 He was making the first proof of a glass measuring cup image in leather, based on a drawing I made in my sketchbook. Lily, our newly become leatherworker / grad student in printmaking, worked on a second proof, so that she could very quickly pick up what Jimmy could teach her, super fast!!!!! She will eventually make 32 of these, with 16 facing right and 16 facing left. Two of them will go onto each of the 16 finished "print" quilts. I hope Lily can still smile after all that! She's very balanced and cheerful now! On Friday of our week at Wash U, I finally was allowed to pull out the sewing equipment, and got to throw a little hand sewing lesson! Devan, Amanda, Maryanne, Sarah, and Leslie were really enjoyable students, happily going through all the steps of some Lucky School of Quilting techniques! In this session, each person made a little 4" square quiltlet of a measuring cup, which I had drawn for them. I started wishing we could have another week, in which to really teach the processes WE knew, to go with the ones they'd been teaching us all week, about printmaking. Oh well. Maryanne plans to come to a Turtle Art Camp, with at least one student, this year, to get them thoroughly versed in what we do. And we may go back to Island Press another time, which would be wonderful! OK, after St Louis, we drove down to Columbus, Ohio, and got treated to a really wonderful group show opening, at The Riffe Gallery, which is the Ohio Arts Council's gallery in The Verne Riffe Center, next to the Statehouse. We are two of seven Ohio fiber artists in the exhibition, along with six Ohio ceramists. 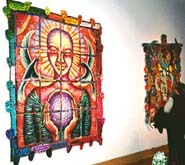 The show's called "Transcending Traditions: Ohio Artists in Clay and Fiber." It'll be up til Jan 8, 2000 at the Riffe, and then travel to Kent State University School of Art Gallery, and later, to The Southern Ohio Museum in Portsmouth. 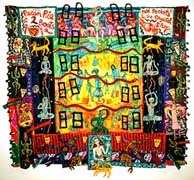 Above is one of our pieces in the show, called "Tropical New York," made in 1988 and revised in 1999. It's 90" x 90." I did a lot more hand quilting on it this October. 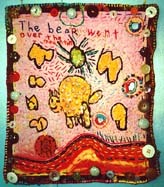 Also in the show are our pieces "Prayer for Oklahoma City," which is 86"h x 78"w, made in 1996 for the touring show of memorial quilts for the children who died in the Oklahoma City bombing, and also "That Old Devil Moon," made in 1994, 82"h x 74"w. It was nice to have three major pieces in this exhibit, hung in a row on one long wall. The gallery was really a feast of delights, with at least that many pieces from each artist! The Ohio Arts Council really knows how to wine and dine, and actually pamper artists!!!! They had a fine arts transportation service pick up our work, from our studio! At the opening, they gave us a lovely luncheon, with the media present; threw a gala opening, complete with "Hillbilly Idol," from Kent, OH, a sorta funky Texas Swing band with black berets; feted us at an elegant restaurant called The Barcelona; and tucked us into bed in a really nice hotel, next to the Riffe! Oh, and they made an amazing full color catalog of the show, with a detail of "Tropical New York," as one of two images on the cover!!!!!! And that cover also became the invitation and some cool posters! Ahhhhh. We could reallly get used to such treatment!!!! Here they are: Hillbilly Idol! They played a long time, in the lobby, outside of the Riffe Gallery, for the exhibition opening of "Transcending Traditions." Al Moss, at left, who plays the steel slide guitar, is the husband of Janice Lessman-Moss, who curated the fiber part of the show. Janice chairs the fiber department at Kent State University School of Art, where I did my MFA, in the 80's. And Al was playing in bands back then, too! If you liked Commander Cody, Deadly Earnest, or Buckeye Biscuit, back in the late 70's, this band is for you!!!! They made it hard to choose between hanging out in the gallery, with our artwork, or sneaking out to the hall, where we could hear the music better and dance on that slippery marble floor!!!!! I already knew what the art looked like!!!! On November 7, we drove down to Athens, OH, for a two week residency at Passion Works, part of ATCO, the Athens County Sheltered Workshop. 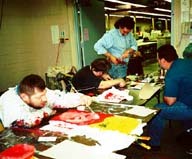 We worked there as visiting artists, with Patty Mitchell, the Ohio Arts Council Artist in Residence there, who created Passion Works Studio in 1998. This program brings making art into the workshop format for people with developmental disabilities. They have already been creating greeting cards, rubber stamps, metal flower sculptures, and tee shirts. There are around 30 people who work at Passion Works, none full time. Many of them have other jobs they are needed at, in the ATCO business, which contracts with Ohio University and other places, to pack things to mail, to make pens, etc. When they aren't needed at other jobs there, they can come over to Patty's part of the building and make art. Some come to ATCO only a few days a week, and others come five days. Patty is trying to build up the income made from art sales, so that some of the people won't have to do any other work, outside of Passion Works. The first thing we saw being done at Passion Works was Patty and Tom making one of the painted metal sculpture flowers. They put a wooden block into a vice, select a metal petal, grab the magnetic drill and a screw, and screw the first petal on. Then they rotate the block in the vice, choose a second petal, and drill again. This is a long process, in order to create a many petalled bloom, and it's stunning to watch them go! Before the building of the flower, people paint both sides of thin aluminum sheets, from the local newspaper, and later, put designs on them. The sheets are cut into strips, put thru a die press with various petal templates, and then stored for the flower making. This is sheer genius and very unique!! You gotta have one of these posies, to grace your table or wall! Oh, and for Christmas, they make wreaths the same way, and also put their flowers on the huge Christmas tree in downtown Athens!!!!! Passion Works has been really well received and supported in Athens! Don't you wish you had Patty Mitchell? For our project, of making a big pink quilt, we switched the painting process to fabric. We pinned fabric panels to foam boards, and clamped them to the tables, the same way the metal sheets are clamped down, so the artists don't have them sliding around. Then they go to work, with acrylic paints and LOTS OF GLITTER!!!!!! Here Carol and Debbie are concentrating hard on making some of the first fabric pieces, putting the base coats of paint down. Carol prefers to do a solid background, while Debbie is totally into the blending of spots of several colors. Mindy and Mary Alice are ready to get back to work, as soon as Patty and Susie get their new colors mixed up. They were so sweet to us, being very excited to make the quilt! Everyone was psyched to have this new and somewhat mysterious project to work on. I think I should add, about here, that many of the people who participated in this project are in wheelchairs. Some can only use one hand, and maybe that usage is really limited. Some can't talk well, or at all. Some can't hear well or at all. Some can't see well. But what we found they all shared is a truly inspiring determination to do as much as they can possibly force their bodies to accomplish. No one ever said to me, "I can't do what you're showing me." No one said "No." Many times, we had to be the second hand for someone, in sewing or painting. They might start the stitch, and we'd complete it. We'd sit together, a team of two people, doing what one person would normally take for granted, to be able to do alone. We'd talk with each other and laugh, and rejoice over the simplest accomplishments. This is the normal, day to day experience at Passion Works. Patty is in big demand, to run around the room, helping each person. They will have to wait for help, unless volunteers come in and literally lend a hand. Makes me extremely humble. Makes me feel like my own disability of being legally blind is a little speck on the spectrum of challenges people can face, in trying to do simple things. If you're ever feeling sorry for yourself, over some thing you can't physically achieve, bop over to the closest sheltered workshop and help out. Better yet, do it anyhow, without having to be into self pity first!!!!!!!!!!!!!!! On Wednesday evenings, the community is welcomed to come in to Passion Works en masse, to help out, tho they are always welcome, any time the workshop is open. Here are daughter and mother Deva and Andi Stern, and spouses Shirley and Howard, stitching away on the panels. Patty is pulling more blocks down from the workwalls, to start another volunteer in their sewing. We used the Lucky School of Quilting techniques, sandwiching the front, back, and padding together, before sewing. We bound the edges with a hefty running stitch, before starting to outline or quilt. All sewing was done by hand, which is my favorite way to work, and of course, with 6 or 12 strands of embroidery floss and a nice, big #2 crewel needle! Let's sew!!!!!!! Over in the men's corner, things are hoppin'! Tom is painting, but watch out. He can start to paint your sleeve, just to be funny, if you don't watch out! And Harry and Jimmy and Ed are hard at work, figuring out the new tool, the Ultimate Tool, I mean, from Aleene's. They ended up with Harry doing some fine woodburning designs on leather pieces. He simply fell in love with this gizmo, and Jimmy and Ed did, too. Jimmy bought one for himself, to bring home. Carol turned out to be one of our stars in the sewing department! She loved making rows of running stitches, as quilting stitches. We enjoyed chatting together while we sewed. Well, as in the larger art world out there, we have here David Dewey, art star of Passion Works. Oops, one of them. You will soon meet his rival, Johnny Dangerously! Anyhow, David loves to draw, which he does a lot of at Passion Works. But he hadn't ever been willing to paint before. Finally I got him to do one of his howling wolf on the mountain panels, to paint it himself. He did a splendid job, working hard. But when I asked him if he's going to do more of this, having discovered how much fun it is, he smiled at me. "Nope," was his first and final word on the subject. But he does love airbrush. More on that later! Here is Carolyn, one of the happiest people working at Passion Works, talking with Patty. Carolyn is painting on a panel that one of the drawing artists has done some line work on. Patty is asking her if she wants some glitter in that paint. Patty found a web site that sells huge 1 lb. bags of glitter for $25!!!!! She bought about 10 bags, I believe, and generously mixed the glitter into the paints being used. In fact, she got heavier with the dosage as we went! This quilt is going to really sparkle...plenty!!!!! Meanwhile, we see that the mens have found a way to make a saleable product with the Ultimate Tool (woodburner) and leather. Ed made Harry some templates, Jimmy cut them out of leather, and is helping Harry steady his useful hand, so he can burn lines into hair holders for ponytails. They found some of those wooden sticks, like we used to get at the meat market, when we ate city chicken. Remember City Chicken?????? Ground up chicken parts, molded into chicken leg shapes, is the best way I can describe it! What happened to that stuff? Do they still sell it? Is it scorned, like Spam and Jello? All those wonderful things we loved as kids: balognie sandwiches, Velveeta, Nestle's Quick. Man, we got into our health, when our bodies just couldn't take it anymore! Maybe the kids are still eating City Chicken. Whatcha havin' tonight? I wanna see you get an eight year old to eat tofu. Really. And like it. If you do that, don't tell me. It's disgusting. What are you doing to that kid of yours? They'll be considered a dweeb at school. Lighten up! This is Jamie. I LOVE Jamie. He can hear, with hearing aids, but he can't talk. He really got excited, when we started to sew, and I soon found out why. This guy gets a big thrill out of sewing, like I do!!!!! His hands are strong, and he GOES!!!!! Besides that, he wears pretty groovy tee shirts! Jamie always had a big, welcoming smile for us, always perked me up, if my energy was lagging in the afternoon. He's one of those people who are just tickled to be alive, it seems to me. I try to imagine this kind of joyful personality in a corporate office. Hmmmmm. Well, I don't work in a corporate office, so maybe my mental version of it is a bad stereotype. Maybe there really are Jamies out there, brightening up your day, by just walking into the room with a big old grim a mile wide. That would be very nice for the whole planet, I think. I had this quiltlet almost finished when we drove down to Athens, and wanted to show it to the Passionettes, before I mailed it to Sandra Sider, in the Bronx. It's a "St. Quilta the Comforter Blesses this Studio." Only she had me modify it, to commemorate the show she's curated, called "Fine Focus," which is made up of small format art quilts and is touring. So I wrote that title in St. Q's halo, and gave her a little magnifier, sewn over the heart and cross doily she always wears on the chest of her muu-muu. This little plastic magnifier had been attached to the catalog of a show at the Bernice Steinbaum Gallery in 1988, when I lived in NYC. It was an invitational show called "Alice through the Looking Glass," and you'd think they'd use a MIRROR, but somehow, the magnifier didn't raise questions. It was just there! I didn't know where else I could get a tiny, plastic magnifier, and this one just fit over St. Q's doily, so the sacrifice was made. I also knew Sandra would value the reference! Near the end of our two weeks at Passion Works, Patty and I decided there needed to be one big fat amazing quilt thing, since we'd realized the panels probably should be shown all next to each other, but really available to buy separately. So we went thrift shopping, as women are wont to do, when they need stimulation. We finally found this little number: a huge and sparkly PINK ... evening gown ... bride's maid dress???? Well, the sucker was pink, and it reminded me of BARBIE. Since we'd been talking about our fabulous big pink quilt for so long, I knew we had to come home with something radically arresting of one's attention. Don't you think we succeeded? We waltzed back into the studio, showing off our prize, to the horror and amusement of our fellow artists. Most of them responded to it, by saying "I'm not going to wear that dress!!!!" Yes, well, that was obviously the reaction of sheer, uncontrollable fashion envy! So we found a ratty old bed quilt, hung it on a work wall, and I sewed the dress down to the quilt right away, lest some jealous person make off with the prize! Here you are! This is Johnny Dangerously. I named him that, because Johnny Marquis delights in making drawings to scare people! 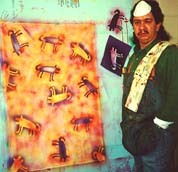 He is the fmaous artist who made the little rasta-looking person, which is the Passion Works logo. The black and white thing. Johnny worked hard, making lots of drawings on the painted panels for our quilt, along with his pal and arch rival, David Dewey, and others. I brought home a panel to quilt and embellish, for which Johnny drew fish that ate David Dewey and other guys at Passion Works. They are inside the fish, in the piece! I have to hussle on this, as there will be a show at The Dairy Barn, home of Quilt National, opening January 30, of Patty's projects at Passion Works, including our quilt panels. Many volunteers, besides those who come in on Wednesday nights, are helping to work on and finish the panels, which will all be for sale individually. Get on down to Athens, and we'll see you there! Jimmy discovered an avid airbrush artist in David Dewey. 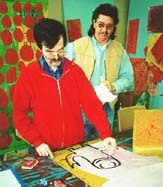 David drew some of his Fat Cat images on paper, and Jimmy made plastic stencils of them. Here the two Art Doctors are painting red Fat Cats onto our Barbiesque Party Dress! For David to be able to paint with the airbrush, someone else has to share holding and working the brush with him. So, if Patty gets an airbrush for Passion Works, maybe you can stop by, and help David work his air magic on more projects! Especially if you know how to run an airbrush and clean it out!!!!!!! After the Fat Cat stencils went onto the dress, we laid the foam board with the quilt pinned to it onto the big tables, and gathered round it as many people in wheelchairs as would fit! Here are Carolyn, Mary Alice, Jim, and Marty, working hard on painting the yellow background around the dress. It was pretty important to paint that nasty old quilt, mainly so it wouldn't fall apart of its own old age!!!!! We're talking not just a cutter quilt here, honey. We're talking GLUER QUILT!!!!! Everyone worked hard and had a big party, slapping on that yellow paint. Then Patty came around with her magic glitter, mixing it into pink paint, and we made glitter polka dots all over the quilt! Why not! The glitter paint base, I believe was Modge Podge, so that's a very fine glue, for holding said mummified quilt together!!!!! MORE GLITTER!!!!! I went back to work with the airbrush and wrote all over the background, once we finally got all that paint to dry, out in the sunshine! I didn't know what I would write, like usual.... But I remembered everyone teasing about who could and who couldn't wear our huge Barbie dress. The men had teased each other, telling each other that THEY needed to wear it, and how good they would look in it. 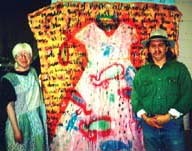 So I wrote that only women, and only the women who had helped on our Big Pink Quilt Project, could wear this dress. I tried to remember all the names of all the Passionettes: the wonderful women with disabilities, the amazing women who help them at ATCO, the generous Wednesday night townie volunteers, the artists who had stopped in to work with us. I searched memories of all our time there, really trying to not miss anyone. I think I fell short by a few, but got most of them. It was fun to do, standing on a couple of chairs, moving from one side of the big quilt to the other, trailing the airbrush hose, as I walked back and forth to create each sentence. After that, Jimmy, David Dewey, and Johnny Dangerously made some "yardage" of stencilled images, as prototypes for a possible fabric design project. Who knows? Maybe we can get Debra Lunn and Michael Mrowka, of Lunn Fabrics in Lancaster, to work with Passion Works on yardage of their funky images! Lancaster is just an hour northwest of Athens, so it could happen! If this fabric fits in anywhere, it goes with Lunns' wild stuff!!!!! And Debra and Michael are wonderful people, who would work well with our artist friends at Passion Works! This will have to be discussed! This is the first panel completely finished for our Big Pink Quilt Project. It's a piece about 12" x 16," made by David Dewey and painted and sewn by me. It's "The Bear Went Over the Mountain." Even though I was working on many small pieces all along, along with everyone else, I had finally realized that I should focus on one piece, so that the group would see what one would look like, completed. It gave them a lot better sense of where we were heading with this project, and how finished the panels would become. Then, whoever walked into the room could pick up a piece in progress, with other artists having already worked on it, and would start to sew, and work as long as they could stay. Most of the panels have had several, if not many, people's hands working on them. Now, it's up to Patty and the Passionettes, to finish about 50 of those babies! And the Big Pink Barbie Dress Quilt, too!!!! Jimmy and I only worked those two weeks, and before we knew it, it was our last day! We really, truly hated to say goodbye to everyone. The buses came in two waves, like usual, to take the Passionettes home. We had to try to find everyone individually, to say goodbye, til we meet again at The Dairy Barn at the opening! I started to cry! Wow, that has never happened before at the end of a workshop! These folks are super fine though! Debbie and I both still had our colds. Tom still was poking along, being late for his bus. Mindy told us she was gonna miss us. We were all very sad. What an experience. Thank you, Patty Mitchell and your Passionette Family!!!!!!! Go to Page Two of this month's diary, to continue. Thanks!